Introducing our new Sports Series 4" High Flow 200 Cell Metallic Catted Downpipes for your N20 four cylinder turbo engine! Fits all 2012+ 320i, 328i, 420i, 428i with the N20 engine (does not fit N26 engine). We've made a simple guide to help you tell which engine you have in your car. Click Here: How to tell if you have an N20 or N26 Engine. CAUTION: This product is intended for OFF ROAD COMPETITION USE ONLY. Not legal for use on pollution controlled vehicles upon public road/highways. THIS PRODUCT IS FOR SALE FOR ALL 49 STATES EXCLUDING CALIFORNIA. In addition to vehicle use verification, a Vehicle Compliance Waiver needs to be signed. THIS ITEM IS NOT FOR SALE, INSTALLATION, OR USE ON LICENSED VEHILES IN THE STATE OF CALIFORNIA. The item is for sale for international customers without restriction. Now available for the 2012+ BMW 328i/320i/428i/420i N20 Engines! High Flow 200 cell metallic catalytic converter used. Higher Max Horsepower Power Curve. Higher Intial Torque Curve. Torque curve hits faster and higher and longer. Better throttle response and faster turbo spool up times. Mandrel Bent 4" piping. Smooth transition to the exhaust system. Precision CNC machined turbocharger V-Band flange. Stainless steel flex section like factory that allows proper exhaust movement and flexibility. Available with high temperature black thermal coating to reduce underhood temperatures. Compatible with the factory or aftermarket exhaust systems. Includes all hardware for complete installation. Restrictions in the exhaust system robs horsepower and torque especially on turbocharged cars. Thus, removing as much exhaust flow restrictions will increase horsepower and torque significantly. The factory catalytic converter found in the factory downpipe is a big culprit of this and is a major exhaust flow restriction. The factory catalytic converter is made up of catalyst material formed into "honeycomb" weaves. Exhaust gas must pass through these tiny "honeycomb" weaves on their way to the exhaust system thus causing a major exhaust flow restriction. It also causes turbulence after the catalytic converter which causes the exhaust flow to slow down (which increases restriction). By replacing the factory downpipe/catalytic converter with our Sports Series 4" High Flow Catted Downpipe, more power is unleashed! The factory catalyter uses a 400 cell ceramic core. What the 400 cells means is that per every inch, there are 400 "cells" that the exhaust gas must pass through. We use a 200 cell metallic core. By having less cells per square inch, these individual "cells" are bigger in size thus allowing exhaust gas to pass through it more easier. Thus, the lower the cell count, the higher the flow. Higher flow = more power, faster turbo spool up (less turbocharger lag) and better throttle response. Bottom line, faster. The benefits of a metallic catalytic converter vs a ceramic like the factory is that it can take more heat and is more durable (last longer). They are also lighter than their ceramic counterparts. Our Sports Series Catted Downpipes is constructed out of 100% 304 grade stainless steel and utilize mandrel bent piping. They are 100% TIG welded by our in house fabricators and built in the USA. The factory turbocharger turbine housing utilizes a 4" V-Band flange which we have duplicated and CNC machined cut out of billet 304 stainless steel. Stainless Steel CNC machined O2 sensor and laser cut brackets are TIG welded using stainless steel rods. The O2 sensor is positioned at the factory location. Since the outlet of the turbocharger is 4" and the factory exhaust system is 2.5", the factory downpipes reduces size using short transitions from 4" before the catalytic convert and 2.5" afterwards. Due to space needed for the cataylic converter, the factory downpipes reduce in size using very short transitions. Since our catted downpipes utilize a s more compact cataylic converter, we have more space. Thus, we use very long transitions. These longer transitions allow the exhaust gas time to smoothly transition from the larger piping to the smaller. This results in less exhaust turbulence and backpressure which again improves throttle response and increase turbocharger spool times (less turbocharger lag). The factory downpipe utilizes a flex bellow section that allows the exhaust system to move. This eliminates undue stress on the exhaust components like the exhaust system, downpipe, turbocharger and exhaust manifold. Many of our competitors do not feel it is important to keep this. While you do not see any adverse affects right away, over time, the stresses caused by not having a flex section and having a rigid exhaust system will cause premature wear and tear. Any stress failures like cracks will form quicker than usual on exhaust manifolds and exhaust components. Also, without a flex section, the exhaust system cannot properly deflect impact. Especially on lowered cars, whenever the exhaust system contacts the ground, the entire system gets pushed up. Without a flex, you can imagine how much stress is put into exhaust components like the exhaust manifold when the exhaust is pushed upwards. We fully understand that durability of our products is important. Thus, like BMW, we incorporate a flex section into our downpipe. Our flex sections are 100% stainless steel (cheap flex sections only have stainless steel center braids and steel caps) to ensure corrosion resistance. 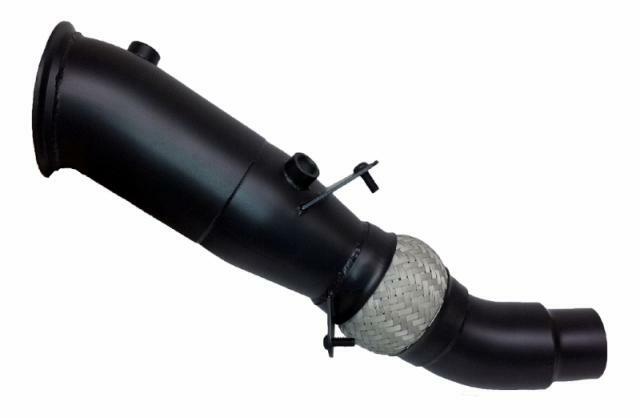 Our downpipes are designed to fit perfectly with either the factory exhaust system or your aftermarket exhaust system. There are no compatibility issues whatsover. The downpipes will come by default with either brushed or polished finish. Ceramic Thermal Coating - The purpose of ceramic coating downpipes is to keep heat from the exhaust gases inside the downpipe from radiating out. This keeps underhood temperatures lower and less heat absortion by nearby parts/surfaces. Another added benefit is that by keeping in heat (energy) in the exhaust gases inside the downpipe, exhaust flow velocities stay up, resulting in lower backpressure. The ceramic coating also adds additonal corrosion resistance. We utilize the best ceramic coating possible. Our thermal coating can resist up to 2000F of heat. It is available in black only (all the other colors cannot withstand heat that high). Additional O2 Sensor Bung - An additional O2 sensor bung can be added so that you can easily add a wideband o2 sensor and gauges so that you can monitor air/fuel ratios. The additional O2 sensor bung will come pre-installed with a plug so that you do not need to run the o2 sensor right away. Optional EGT (Exhaust Gas Temperature) Bung - An additional 1/8" NPT bung can be added so that you can easily add a EGT sensor and gauge. The optional EGT sensor bung will come pre-installed with a plug so that you do not need to run the EGT sensor right away. Free keychain lanyard and license plate frame with purchase! ITEM IS NOT AVAILABLE FOR SALE ONLINE. A COMPLIANCE WAIVER MUST BE REVIEWED AND SIGNED BEFORE PURCHASE. ITEM IS NOT FOR SALE IN CALIFORNIA. PLEASE CONTACT US FOR MORE INFORMATION.